As the sun was rising in Wilmington, North Carolina on Friday, February 28, 2003, it was already mid-day in Cairo, Egypt; Riyadh, Saudi Arabia; Warsaw, Poland, and London, England. World events were unfolding as the day was just beginning at Dolorosa Arabians, the farm owned by Dr. DeCarol Williamson and his wife Jan, breeders of national and international champions for over 30 years. The horses of Dolorosa began to stir as feeding time approached, but the beautiful chestnut mare DA Love had other matters on her mind. Her labor pains had begun, signaling that her time was near. While most of the world was looking forward to the weekend and a change of pace, DA Love was giving birth to a foal that would change the history of the Arabian horse breed. DA Love (Padrons Psyche x Magnifficaa FA by Echo Magnifficoo), was in foal to Versace, a stallion who has become an icon in the Arabian horse industry and universally admired for producing foals of extreme beauty and quality. DA Love gave birth to a beautiful, dark, rich bay colt. He was everything DeCarol Williamson had hoped for – and more. Even as a foal, DA Valentino’s quality and exceptional conformation were immediately apparent. DeCarol watched the colt at his dam’s side and as each month passed he just got better and better. In May of 2004, Rob Bick showed DA Valentino for Dolorosa Arabians at Region 12 where he was Champion Sweepstakes Yearling Colt. Word spread quickly about the new superstar colt and soon DeCarol Williamson received an offer for Valentino from David Boggs for one of his clients. After some negotiating, DeCarol agreed to sell the colt, but he retained rights for 12 breedings per year because he was certain that Valentino would prove to be an exceptional sire, as well as a show ring sensation – both predictions came true. In August of 2004, David Boggs negotiated the purchase of DA Valentino for his long time friends and clients, Dan and Maureen Grossman. They successfully campaigned Valentino to a record breaking number of wins. In fact, DA Valentino is the only stallion in the breed to earn six national championship titles in halter including: 2004 US National Champion Yearling Colt, 2006 Canadian National Champion Two-Year and Older Stallion, 2006 US National Champion Futurity Colt, 2006 US National Champion Junior Stallion, 2007 US National Champion Junior Stallion, 2008 US National Champion Junior Stallion. Throughout his show career, DA Valentino was shown 21 times and earned 21 championship titles – he remained undefeated. DA Valentino was poised and ready to return to the show ring in 2011. It had been almost two years since his last show ring competition and he was to make his debut at the Arabian Breeders’ World Cup Championships in Las Vegas, Nevada. Everyone was very excited to see this great stallion. Then tragedy struck. On Friday, April 8, 2011, DA Valentino was rushed to the vet and into emergency surgery. Every effort was made, but the Arabian horse community lost one of its brightest stars and one of the most successful stallions in the history of the breed. DA Valentino was only eight years old, and he was already on the AHA Arabian Horse Data Source list of leading sires in the world. One week before he was to make his Las Vegas debut, DA Valentino was taken from us. The Breeders’ World Cup Championships is truly a special event. It is a show created by breeders for breeders and they come from around the world to see some of the best Arabian horses imaginable. DA Valentino’s absence at the 2011 Breeders World Cup was conspicuous, and he was greatly missed. A bittersweet video tribute was created and presented at the show in his honor. As the lights went down and the film began, a hush fell over the crowd as they were swept away with the beauty and majesty of DA Valentino. There was one person among the crowd of hundreds watching the film in the darkened area. His perspective of the tribute was unlike any other because he knew DA Valentino more intimately than any one, he was more proud of the stallion than anyone else ever could be; he was Valentino’s breeder, DeCarol Williamson. Looking out over the crowd as they watched the beautifully crafted film, DeCarol was overwhelmed by the love and admiration the people had for the internationally acclaimed stallion that began his extraordinary life at Dolorosa Arabians. As DeCarol looked over the sea of people whose attention was riveted on the beautiful images of the glorious stallion, he spotted Ted Carson, the talented trainer who had once worked for him at Dolorosa Arabians. DeCarol saw Lenita Perroy of Haras Meia Lua, owner of Ali Jamaal; he saw Sheila Varian, whose breeding program is responsible for Bay El Bey, the sire of the great Bey Shah. DeCarol saw Dr. Marek Trela, Director of Janow Podlaski in Poland, the homeland of many of the great Polish horses in DA Valentino’s pedigree; and he saw Sigi Siller, the breeder of the great stallion El Shaklan, one of Valentino’s great grandsires as well. Looking further, DeCarol also saw David Boggs, who had showed Valentino to many of his wins, and he saw Dan and Maureen Grossman, Valentino’s owners since August of 2004. All these people, and so many more, each had a connection to DA Valentino. 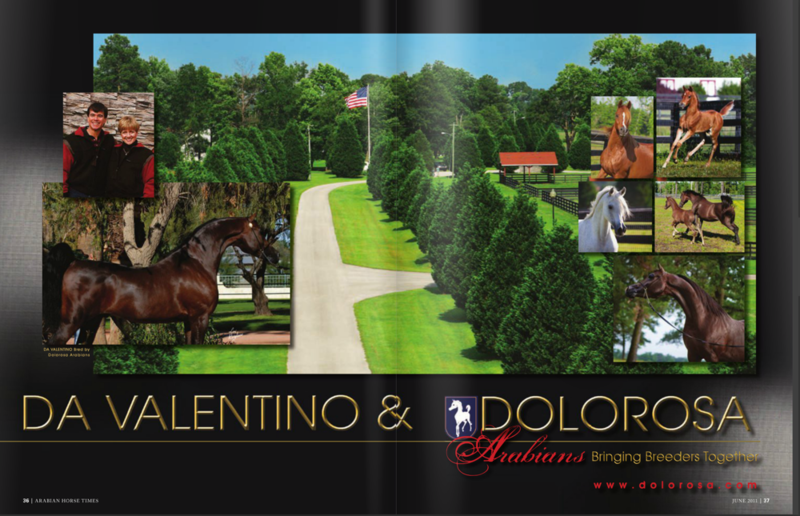 Thinking of DA Valentino and his beginnings, DeCarol recognized defining moments, pivotal events in the past that had lead him to the present and are now taking him and Dolorosa Arabians into an exciting new future. Over the past 30 years, Dolorosa Arabians has been equally successful in breeding national champions in halter and performance. With his ever-expanding business and professional life, DeCarol has recently decided to focus his breeding program at Dolorosa Arabians on halter and breeding horses. This is not a huge shift because DeCarol established his group of foundation mares decades ago, and he is now into breeding his third and fourth generation of halter horses including DA Valentino. It is amazing how circumstances bring people together – some call it serendipity, others call it divine attraction. In the early 1990’s, DeCarol Williamson was in Arizona for the Scottsdale Show. His long time associate Doug Leadley, told him about an exciting young stallion he had seen. They made an appointment and went to see the horse; his name was Padrons Psyche. DeCarol remembered that they handed him Psyche’s lead and the power he felt coursing through it was electrifying. DeCarol was impressed with Psyche’s stature, type, and powerful movement. At that moment, he knew he wanted to incorporate Psyche into the Dolorosa program and he purchase several breedings. DeCarol used those breedings and he now has five wonderful Psyche daughters that are part Dolorosa Arabians’ foundation mares. Several years later, Ted Carson, who was working for Dolorosa at the time, told DeCarol about a two-year-old filly he thought would make a great addition to the farm’s herd; her name was Magnifficaa FA (Echo Magnifficoo x Jamaara FA by Ali Jamaal). After looking at her pedigree, DeCarol’s interest was piqued. He respected Echo Magnifficoo’s ability to sire offspring with scope and great neck sets, and he certainly admired Ali Jamaal and his proven performance as a sire of international champion offspring, but it was Magnifficaa’s maternal grandmother, NV Tiara Bey, by Bey Shah, that really sold DeCarol on the young filly. He purchased the filly and the following year she was bred to Padrons Psyche. In 1999, she had a beautiful chestnut filly, DA Love. When DeCarol Williamson attended the Scottsdale show in 2002, he saw Jeff Schall showing a colt that mesmerized him. Later on, he went over and visited with Jeff who took the colt out for DeCarol. Odyssey SC(Versace x Latoura Echo by Echo Magnifficoo), had a look and style that DeCarol really liked. However, he was not for sale. DeCarol decided if he couldn’t buy Odyssey SC, then he would attempt to replicate the breeding, crossing Versace with one of his own similarly bred mares. DeCarol selected DA Love because she carried lines to both Padrons Psyche and Echo Magnifficoo. DeCarol believed if all the stars aligned just right, the foal might inherit the best qualities of all of these great horses. Versace has become an important source for overall classic type, quality conformation, and wonderful temperaments for the Dolorosa breeding program, and his sons and daughters are proving to among their best producers. DeCarol visualized the possibility of a foal that would result from the pairing of Versace and DA Love. It would be a beautiful mahogany bay with an exquisite face; a long well set neck, a beautifully smooth body, great tail set and carriage, excellent movement, and a gentle temperament. DeCarol put his faith into his vision, and on February 23, 2003, his vision came to life in the form of a beautiful bay colt that was destined for greatness – DA Valentino. DeCarol Williamson is understandably proud to be the breeder of such an amazing stallion, but he refuses to take all the credit. He earnestly acknowledges all the people whose efforts culminated in an individual of near perfection – from the tip of his ears to the end of his beautifully arched tail. Rightfully so – no breeder can claim exclusive credit for producing a horse. Each animal represents the efforts of hundreds, if not thousands of people. In this way, the Arabian horse brings us together and connects us though a love that few can define, but many of us share. DA Valentino brought breeders, owners, trainers, dreamers and many others together. Although he is no longer with us, we are fortunate to have his sons and daughters to carry on his lines. 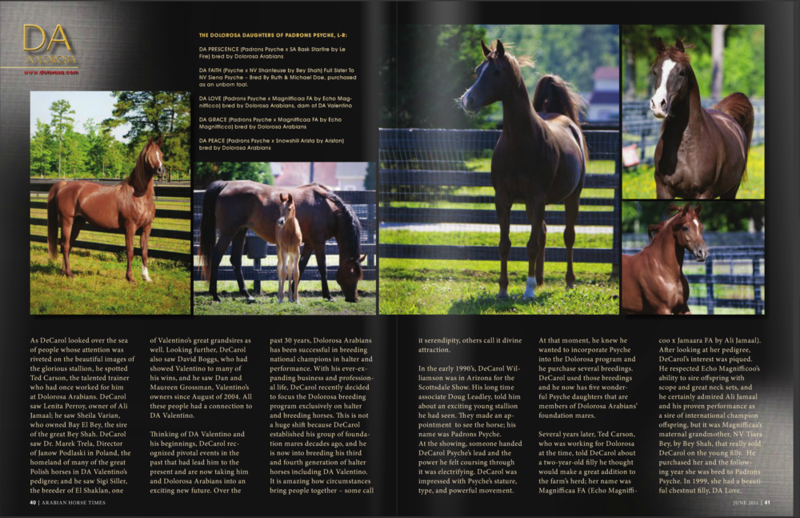 DeCarol remains committed to DA Valentino and he has many wonderful foals sired by Valentino at his farm. Dolorosa Arabians was blessed to have bred a stallion as wonderful as DA Valentino, was it possible for such a gift to be bestowed upon a breeder more than once? DeCarol Williamson was so impressed with DA Valentino that he bred DA Love back to Versace. In fact, Dolorosa Arabians has three full siblings to DA Valentino. DA Legacy is a handsome four-year-old bay stallion that produced his first foals in 2011. They are fantastic and demonstrate extreme type, excellent conformation, and amazing movement and tail carriage. DeCarol will continue to test DA Legacy’s ability as a sire. Dolorosa also has a full sister to DA Valentino; DA Valentina, a four-year-old mare that produced her first foal in 2011, a very high quality filly by Marwan Al Magnifficoo. Valentina is bred to RHR Marcedes for a 2012 foal. Completing the group of full siblings is the youngest brother, and perhaps the star that will eclipse the others; his name is DA Prodigy. Dolorosa Arabians and DeCarol Williamson have been acknowledges as leading producers of national champion Arabian horses. In fact, the Arabian Professional Horsemen Association named them 2004 Breeder of the Year. DeCarol Williamson earned that title by breeding horses such as DA Valentino and now his full brother, DA Prodigy. The qualities that made DA Valentino a six time national champion and an undefeated show champion are mirrored in DA Prodigy, yet he has certain qualities that even exceed those of his world famous brother. DeCarol placed DA Prodigy into the capable hands of Ted Carson, the very person who brought DA Prodigy’s grand dam to DeCarol’s attention, and ultimately into the Dolorosa breeding program. DeCarol will never forgot that connection and he gives Ted the credit for his contribution to DA Valentino and now DA Prodigy. With Valentino’s overwhelming popularity and success, DeCarol thought it would have been counter productive to campaign his younger brother. However, with each ending there is also a new beginning and thus with the passing of DA Valentino, the brother who stood in obscurity is about to take center stage in Tulsa, Oklahoma. DeCarol Williamson has two goals in taking DA Prodigy to the U.S. Nationals; first and most important, to share him as an inspiration with breeders around the world, and second to possibly win the title of U.S. National Champion Futurity Colt. DA Prodigy’s conformational excellence is evident to all who see him. However, his genetic power will be proven next year, in 2012, when his first foals are scheduled to arrive. DeCarol selected a small group of Dolorosa mares, including some bred by the farm and representing a variety of bloodlines, for Prodigy. DeCarol is excited to see what he can achieve through line breeding his bloodstock. For now, he must wait and patiently muse about the possible results. Patience and perseverance; these are two more common traits among successful breeders. 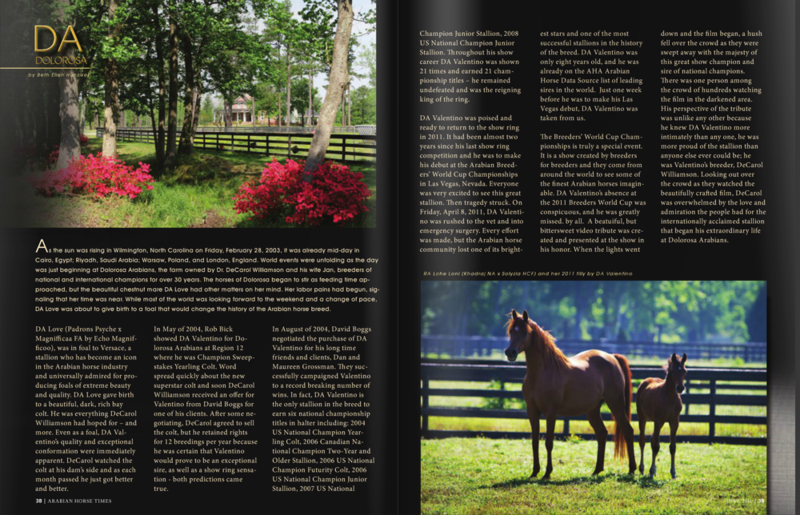 DeCarol’s experience with Arabian horses over the past 30 years and his previous achievements in breeding halter and performance national champions at Dolorosa Arabians are the foundation for his patience. The inspiration for his perseverance is his deep love for the Arabian horse. DeCarol Williamson’s goals for Dolorosa Arabians are simple – to share the Arabian horse with others and bring breeders from around the world together to enjoy and preserve these magnificent creatures for future generations.